Amrut, that Bangalore company which makes the Old Port rum I tried many years ago, as well as whiskies many swoon over, is no stranger to making rums, but their marketing effort is primarily aimed at the subcontinent itself, and perhaps other parts of Asia (maybe they’re chasing Old Monk, which is supposedly the #1 rum in India). There’s not much of a range (five rums in all), and I rarely saw any of them in Canada – this one was bought in Europe. Given that this particular rum is a blend of – get this! – Jamaican, Bajan, Guyanese and Indian pot-still rum, one can perhaps be forgiven for asking whether they’re going in the direction of Ocean’s Atlantic Rum; and as far as I was concerned that one suffered from overreach. But at least we know where the “Two Indies” moniker derives, if nothing else. It’s also worth commenting on one thing: the Indian component of the rum is supposedly a pot still originating distillate based on jaggery, which is a natural sweetener made from sugar cane…whose by-product is molasses so one wonders why not just go there and have done, but never mind. The issues (not problems) we have are two fold: firstly, jaggery is actually made from either sugar cane or the date palm, so I’m unsure of which variation is in use here (since sugar cane jaggery is cheaper, I’m putting my money there); secondly, assuming the jaggery is from cane, it is in effect a reduced version of sugar cane juice – a syrup – what we in the West Indies and parts of South America sometimes refer to as “honey”. So in effect there’s nothing particularly special about the matter except that its source product is made in Asia and widely known there. And, of course, the marketing, since it suggests a divergence and distinction from more familiar terms. Consider first how it smelled. The nose began by presenting a sort of lush fruitiness that spilled over into over-ripe, almost spoiled mangoes, persimmons and sweet tropical fruit and kiwi, something also akin to those cloying yellow-orange cashews the snacking nuts are made from (not those with the stones inside). In the background there lurked caramel and vanilla, some cloying sweet and also breakfast spices (cloves and maybe nutmeg mostly, though very light) just as the Old Monk had; and overall, the aromas were heavy and (paradoxically enough) not all that easy to pick out – perhaps that was because of the inoffensive 42.8% ABV it was bottled at. I liked the taste a lot better, though that queer heaviness persisted through what ended up as a much clearer rum than I had expected. So, bananas, more of the mangoes and cashews, honey, papayas, and the spices. Adding some water released some chocolate and coffee, nutmeg, more vanilla and caramel, maybe some light molasses, some licorice, a nice twist of citrus rind, which I liked – it provided an edge that was sorely needed. Finish was soft and quick, reasonably clean and warm, but was mostly the spices and caramel than anything else. Reading around doing the usual research (and there is really not very much to go on so I have an outstanding email and a FB message sent out to them) suggests there are no artificial flavours included: but I dunno, that profile is quite different, and the breakfast spices are evident, so I gotta wonder about that; and the overall mouthfeel does suggest some sugar added (no proof on my side, though). This doesn’t sink the drink, but it does make for an unusual experience. You’re not getting any Jamaican funk, Guyanese wooden stills or easier Bajans, nor any of that off-the-wall madness of an unaged white popskull. It is simply what it is, in its own unique way. On balance, a decent enough drink. I liked it just fine, though without any kind of rabid enthusiasm – it was from somewhere new, that’s all. You could drink it neat, no issues. Personally I thought the flavours were a mite too heavy (it stopped just short of being cloying) and meshed rather clumsily in a way that edged towards a muddle rather than something clearer and more distinct that would have succeeded better. Much like the Tanduay, Mekhong, Tuzemak, Bundie or even the Don Papa rums, I suspect it is made based on a local conception of rum, and is for local palates. Add to that the terroire concept and you can see why it tastes so off-base to one weaned on Caribbean tipple. There’s a subtle difference from any of the British West Indian rums I’ve tried over the years, and though the Two Indies is a combo of several nations’ rums, I can’t separate the constituents and tell you with assurance, “Oh yeah, this comes from Foursquare” or “That’s Hampden” or even “PM!” (and no, I don’t know whether these were the constituents). So, they have used jaggery rather than molasses to make it, blended their way around a mishmash of profiles, and while I liked it and was intrigued, I didn’t believe all that was really needed and may even have made it less than its potential. In Guyanese creole, when we see that kind of thing showing itself off as an artistic blending choice we usually smile, grunt “jiggery-pokery” and then shrug and fill another tumbler. That pretty much sums things up for me, so I’ll leave it to you to decide whether that’s a compliment or not. The rum makes no mention of its age, and nothing I’ve unearthed speaks to it. That was also part of my email to Amrut, so this post will likely be updated once I get a response. An entry level rum with some unusual and remarkably pleasant flavours that one has to work too hard to find in the raw scrape of underaged alcohol. 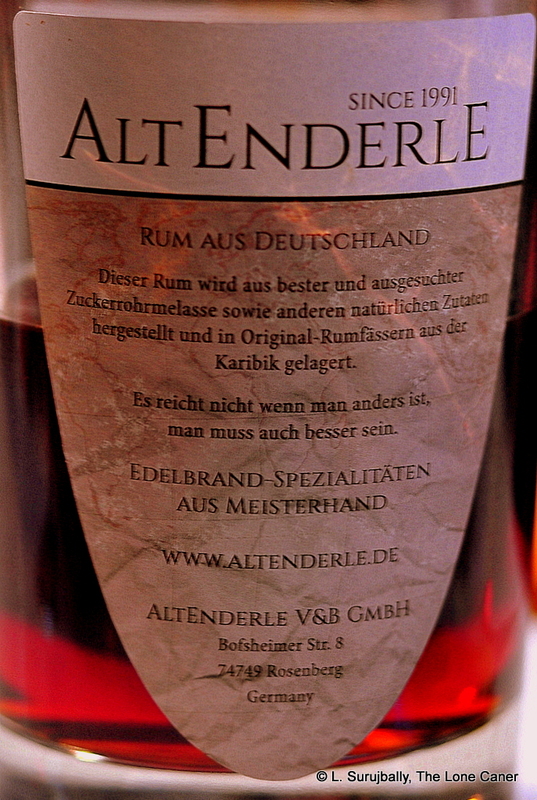 One of the things I noted when nosing this dark mahogany-red rum from the German outfit Alt-Enderle, was the baking spices that presented themselves almost immediately. At 43% strength there was no real savagery here, and I didn’t bother letting it rest before trying it (when you practice on cask-strength muscle-twitching bodybuilders, anything under 50% seems easy), and all I remarked on at the inception was how many different, mild, spiced up elements there were. Cinnamon, vanilla and smoke were in evidence from the get go, but also nutmeg, and some cloves. It was quite an interesting experience, to be honest. I won’t pretend that all was sunshine and roses, of course. The rum had been aged for only a year, and some of that youth was evident on the mouthfeel, where sharp and raw alcohol notes almost obliterated what could have been a much more interesting sipping experience. It also dampened the flavours, though I detected vanilla, more cinnamon and nutmeg (as from the nose), followed by some cloves, orange peel, some raisins and a plummy note, wound about with a faint tannic taste, all blending reasonably into the whole. No joy on the finish, I’m afraid, and this was the weakest part of the entire drink – short and sharp, giving little back aside from some more vanilla and caramel hints. The molasses from this intriguing rum hailed from India, which may account for that oomphed-up mommy’s-kitchen profile, unusual in island specific rums. 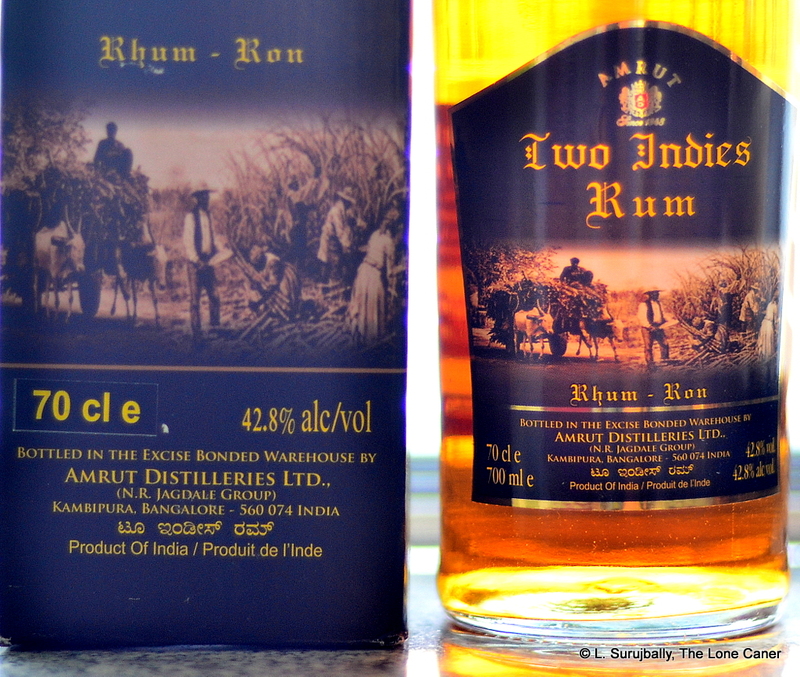 I remember noting something similar in the profiles of Amrut Old Port and the Old Monk Very Old Vatted, though I never wrote about the latter, being a little too loaded at the time to recall my own name, let alone tasting specifics…it may be another example of something noticeably distinct, like Bundaberg is, or the other Indian rums. To make sure, however, I emailed the company asking whether anything was added to the rum to enhance the flavour profile (still waiting…). 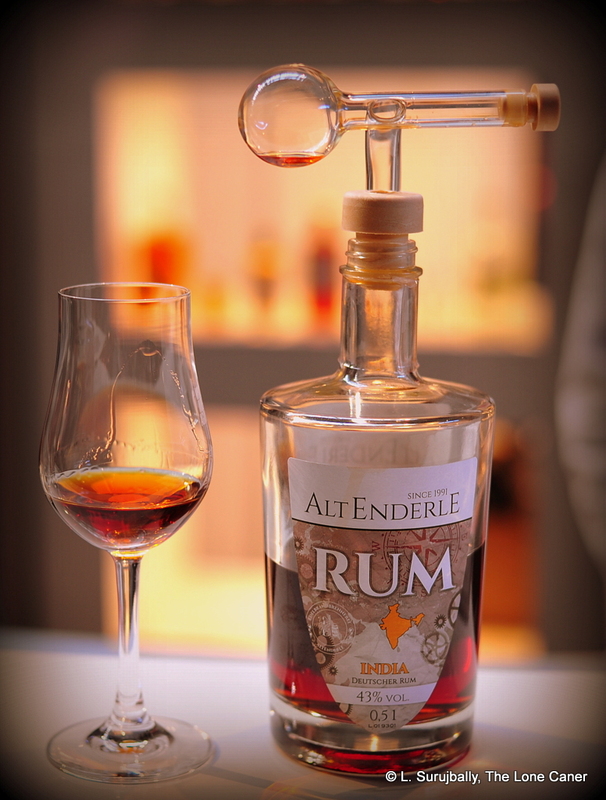 Like Old Man Spirits, Alt-Enderle is a German company which makes rums among other spirits. Established in 1991, they are located about a hundred kilometers south-east of Frankfurt, and it seems to be a fairly small operation. They do however make rums from molasses imported from other countries – Thailand and Paraguay are two current examples. I’m not sure what their philosophy really is regarding rum – like most micro distilleries, they appear to toss them off almost as afterthoughts in their quest to make other liquors like (in this case), whiskies, absinthe, herbal liqueurs and brandies. They distill the molasses themselves — a photo on their website suggests they have a copper still — and set the resultant to age in barrels sourced from the Caribbean. Putting all impressions together, I’m scoring this rum at 81, and naming it an entry level spirit. But be advised, it’s not entirely a bad product, and should not be casually written off like yesterday’s fish. The “India” had some real originality in the tastes and aromas– they were distinct, if faint, and points have to be given for that. I have a feeling that the barrels are part of the reason it was not better than it could have been. When told that the rum was aged in Caribbean barrels, some of which were thirty years old, this is not to be considered a point of pride, as I remarked to the booth agent, but of concern, as it suggested dead wood with not much more to impart than maybe some good advice. Was it a cost cutting measure? Hard to say. My own advice here would be to age the rum a little more (and take the hit on maturation and warehousing costs), in barrels with a little more zest left in them. This rum is a decent starter drink, good for a mix somewhere (especially since it’s not added-to with those spices) …but it could also have been better. €45 for a 500ml bottle. Aside from the marketing blurb on the back label, there’s a quote: “It’s not enough to be different…one must also be better.” I like that thought. 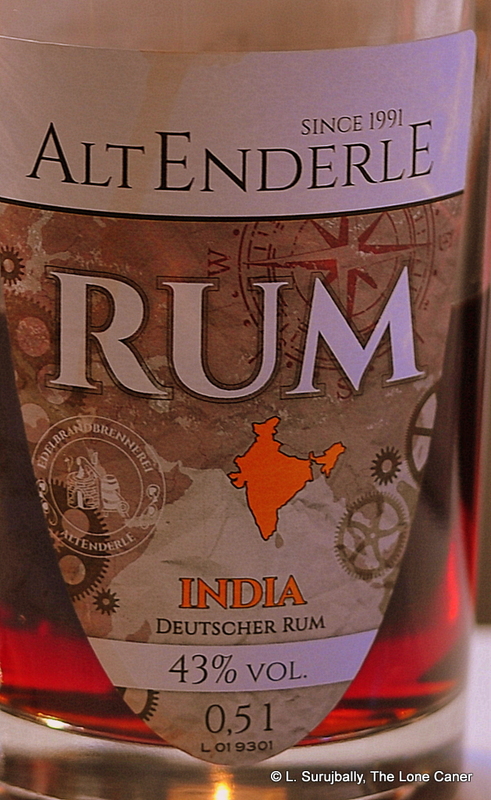 Just because the molasses hails from India does not make it an Indian rum, I believe. Otherwise a lot of Caribbean rums would either be noted as Guyanese or Barbadian because of the source molasses. First posted 30 July 2010 on Liquoirature. Didn’t Clint and the Last Hippie just post good reviews of Amrut’s fusion whisky the other day? 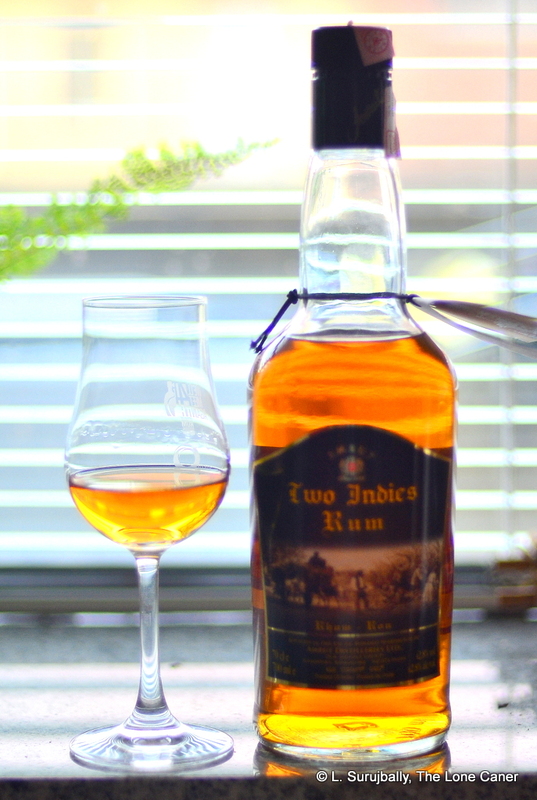 In researching the second of three new rums for the July 2010 gathering, I discovered (much to my surprise), that the same company out of Bangalore India, makes this very capable young rum called Old Port (I can’t get any details on ageing, distillation methods or composition for this baby, alas). Now India having spoken English longer than America, being a British colony ever since Clive in 1757 (look up Plassey, ye historically challenged ones), I sort of expect the whisky production (and definitely gin), but this was the first rum from there I had ever managed to snag. This is the dark side of having so little choice, here in Calgary: you grab anything new with a price tag and hope for the best, and in your hurry to elbow the other guy out of the way, you don’t read the label carefully enough. I should have picked up the reference. From country hooch, local tipple, flavoured vodkas, gins, brandies and whiskies, all based on molasses, to premium whiskies like Fusion and its counterparts is quite a step. But I have to tell you that the rum as a whole wasn’t bad at all, and I liked it a lot. It didn’t really have much competition that evening – el Dorado Five and the disappointing Mount Gay Extra Old – so it turned out to be the sleeper of the evening, in my opinion. With the gradually increasing prescence of this 60+ year old distillery on the world liquor stage, all I can say is I look forward to their premium offerings to come: Curt was impressed with their whiskies, but I gotta tell you, if this was an example of their rums, they are worth watching in the future for something really stellar.